Hidden amongst a grove of green, the understated Chez Panisse gently reveals itself in all its glory. It’s famed owner, Alice Waters is one of the pioneers of California cuisine. She is the original advocate of sourcing fresh, organic, seasonal produce from farm and bringing it to the table. Alice Waters also created the now famous Slow Food Movement and the Edible School Yard concept. 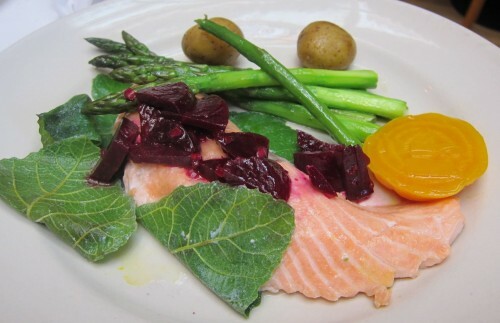 Influenced greatly by French countryside cooking, the menu at Chez Panisse Café changes daily depending on locally available, fresh produce. Many of the dishes on the menu are named after the local farms or suppliers of their fresh meats or cheeses – such as Baked Andante Dairy Goat Cheese or Riverdog Farm Artichoke salad or Soul Food Farm Chicken and so on. 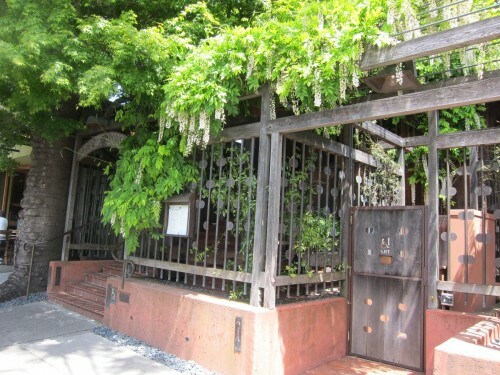 Chez Panisse has an upstairs café area, which is more informal and less expensive, which serves lunch and dinner. The more formal and expensive downstairs section serves a prefix dinner only. 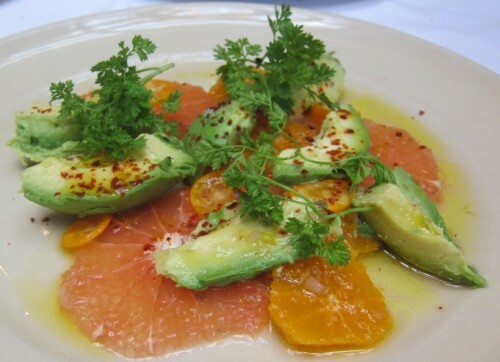 Eating at Chez Panisse Café is truly a delight. Its art is in the simplicity of the dishes. 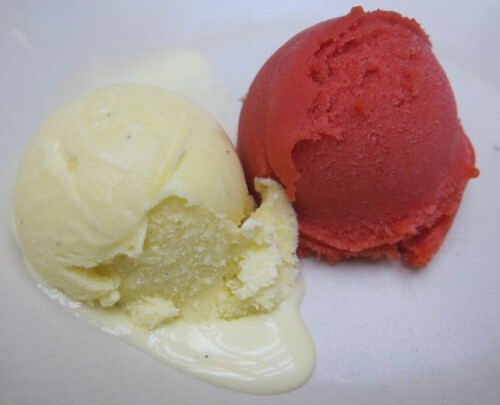 The emphasis is really on the freshness and flavor of the ingredients themselves. You wont find very complex sauces or crazy gourmet dishes here. Everything is simple simple simple. That is the charm of their food. 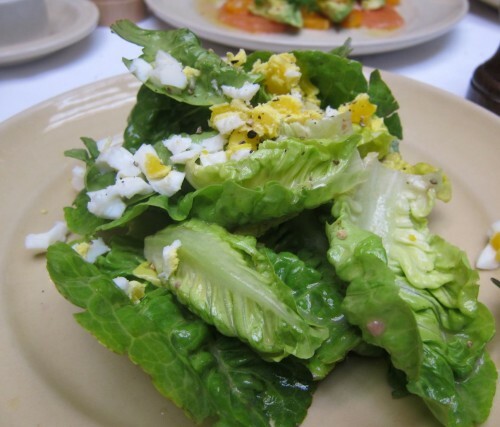 This crispy lettuce leaves were lightly flavored with anchovy, garlic and egg. The combination of different kinds of citrus fruits with ripened avocado in this salad, topped with a ginger vingeratte was just fantastic. There was a burst of tangy flavor with every bite. 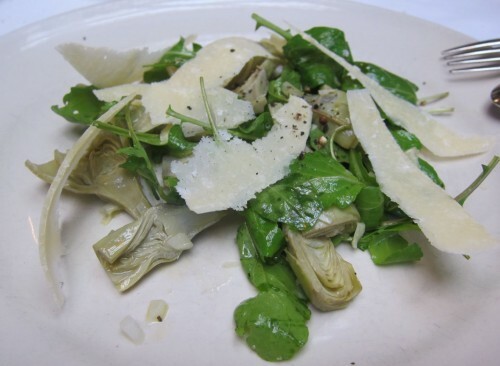 These tender artichokes were paired with crisp arugala with lemon, crunch black pepper and thinly sliced pecorino. Delicious! 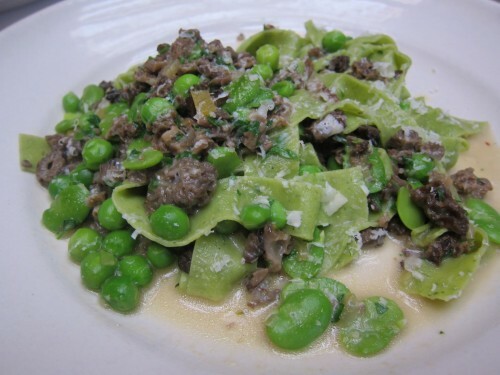 These fresh green noodles came with morel mushrooms, crème fraiche, thyme and peas. I loved how the emphasis was on the vegetables and the noodles, though fabulous, only provided the backdrop for the dish as the vegetables were the stars. This is one of the most delicious salmons I have ever had. It was cooked to perfection – so delicate – it melted in my mouth. It was served with asparagus, chervil and beet relish. 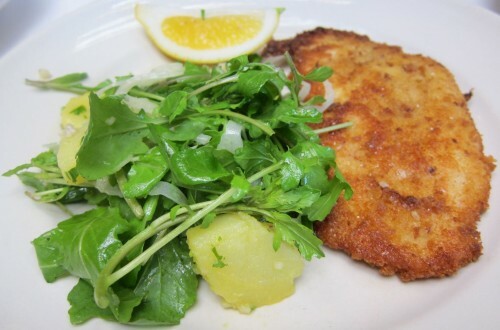 This tender chicken was cooked to a crisp and served with rocket and fennel salad and lemon. These tiny clams just melted in my mouth. The squid and clams were just divine. It was served on a bed of chickpeas, leeks and aioli. 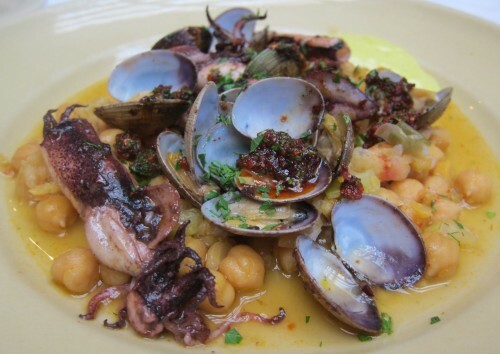 I didn’t care much for the flavor or the chickpeas but the seafood was just pure bliss. 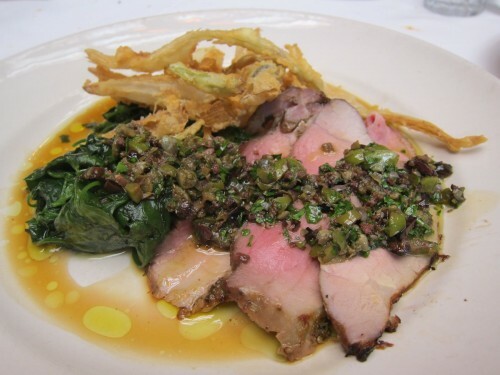 This perfectly cooked pork was topped of with a fresh tapenade and served with airy fried spring onions and delicious wilted greens. The desserts were all exquisite. 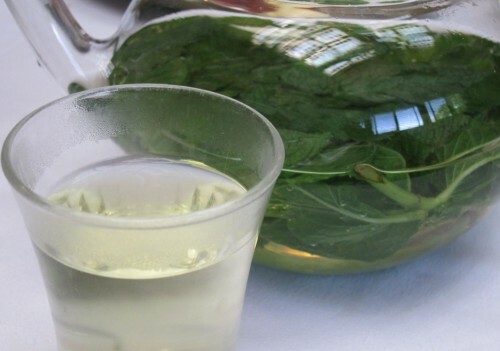 You could really taste the freshness of the ingredients. I loved the both the tarts. The crusts for both were fresh and made all the difference to the tarts. 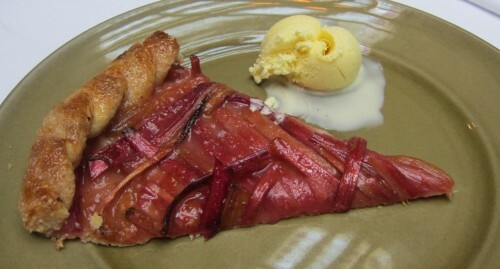 This tart was served with a vanilla bean ice-cream. 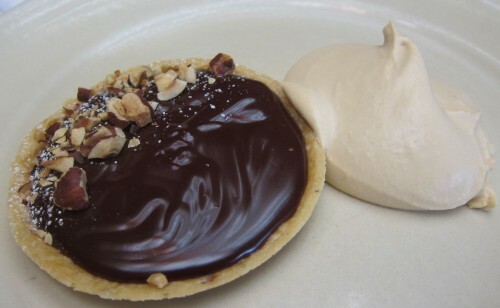 This tart was served with fresh caramel cream and hazelnuts. This was served with vanilla ice-cream and a coconut tuille.